The options seem endless but a few pieces of deck and patio furniture are definitely functional and desirable. Recently, we purchased a deck umbrella and a storage box for the patio furniture cushions. Both ended up being high-quality products and great buys for us. Here’s a quick review for you. 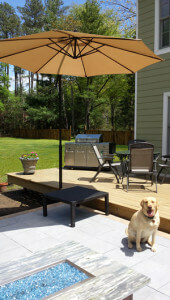 A few months ago, we found a cantilevered deck umbrella on Amazon; sold by Wayfair. It is a Jordan Manufacturing 10′ Cantilever Umbrella and we really like this addition to our patio furniture. Excellent quality for the price; it was under $100 at the time of purchase. One thing to note, we didn’t use the stand/base that came with it. 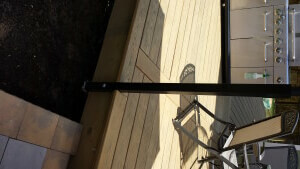 Instead, I attached a 2″ x 2″ x 4′ square metal railing post to the side of the deck. The round umbrella pole (without the stand) fit perfectly into the square metal post. This post-mounting method also allows the umbrella to be much higher in the air which created a larger room feel. In addition to that, it eliminated the need for the large stand that takes up space on the deck. The powder-coated black metal post resulted in a sleak, clean look for the cantilever umbrella. 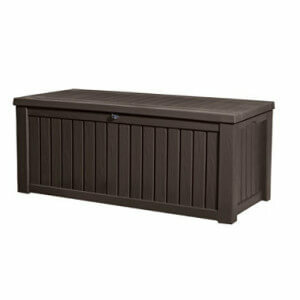 We also purchased a Keter Rockwood Deck Box, 150-Gallon which is available at Amazon as well as Sam’s Club. The deck box was on sale for $100 when we purchased it. We are using it to store patio furniture cushions. It is a sturdy container made of weather-resistant polypropylene resin (recyclable material) and it includes an automatic lid. After a good rain, we found everything inside dry. For the price, I can’t complain but I did need to replace a few of the small screws used to hold the automatic lid with larger screws. The small screws that came with it didn’t hold well and came out after using it a few times. Using larger screws on the lid definitely made it sturdier. Also, you should use a lock so the lid doesn’t blow open in heavy wind. Overall, my review is positive (given the price) and we are glad we purchased this deck box. 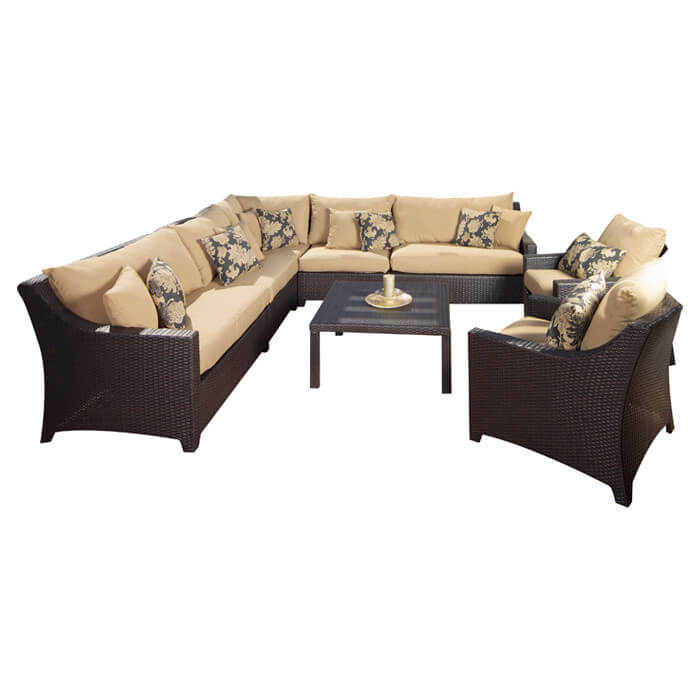 Patio Furniture: We found a great deal on patio furniture at Amazon; Delano RST patio furniture sold by Wayfair: RST Brands OP-PESS9-DEL-K Delano 9-Piece Corner Sectional Sofa and Club Chairs Set . We are very pleased with the quality of the patio furniture and the customer service provided (highly recommended product). Copyright © 2019 Homeowner GC. All rights reserved.